At 10:00am I finally got the call from the Ford dealer in Dallas stating that the new pump was installed and it was ready for pickup at any time. When he first got on the line I was afraid that he would say – “Wrong pump Jimbo” – or “Still has a problem Jimbo!” Thank you Daniel at the Ford dealer for getting it right. I then had to ask him to pick me up at the InTown Suites. I purposely stayed there since it was only 2 miles from the dealer. In the mean time the maintenance crew for InTown Suites had just knocked on my door to tell me that they were installing a new A/C in my room. PERFECT TIMING. I had 2 TV dinners, water, a couple of Dr Peppers and of course my Corona’s. Rather then have to haul all of that stuff I gave them to the maintenance crew. He told his guys to come in and grab the water and Dr. Peppers, while he kept the TV dinners and the Corona’s for himself. What a guy!! That way the refrigerator was cleaned out. I was planning on heading over to Lake Arrowhead State Park out side of Wichita Falls, TX. I didn’t get out of Dallas until about 2:00pm. Once I hit Wichita Falls I decided to go on further. The “Breeze” (my Lazy Daze) was running GREAT and I was really enjoying driving it and didn’t want to stop. I finally drove all the way to a tiny RV park 10 miles outside of Crowell, TX. I pulled in as it was starting to get dark. The hosts were really nice people and they were so glad to see me. I was the only one in the park. I am so thankful that this day ended the way it did. Tomorrow I will be heading out to Palo Dura State Park. Since the weather has improved and it no longer feels like I am on the equator in the middle of summer, I am thinking of staying there for 3 days . I have heard that there is no Internet or cell phone coverage so I may not be able to share my experience there until later. Thanks everyone for all the words of encouragement and thanks Steve for the infamous pump part number. I am just so happy to be back on the road and in an adventurous mindset! This entry was posted in Palo Dura State Park, Repairs, Texas, Texas State Parks by Jim Melvin. Bookmark the permalink. Wow, you are headed to a gorgeous area! I can’t wait to see your photos. Why does “On the Road Again” come to mind? Enjoy, my friend! Glad you finally got the pump issue worked out. 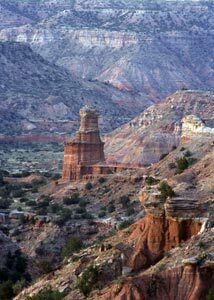 Palo Duro Canyon is beautiful, you’ll love it. Good to hear you’re back on the road. I’m like you – why stop when everything is working. Driving is one of my favorite parts of this lifestyle. Wow I have always enjoyed your pictures…. You must feel free again… I agree with Gary I too love to drive our rig….